Marks/Label: Handwritten on front: July 1940. Written on reverse: Andrew "C" Gow. 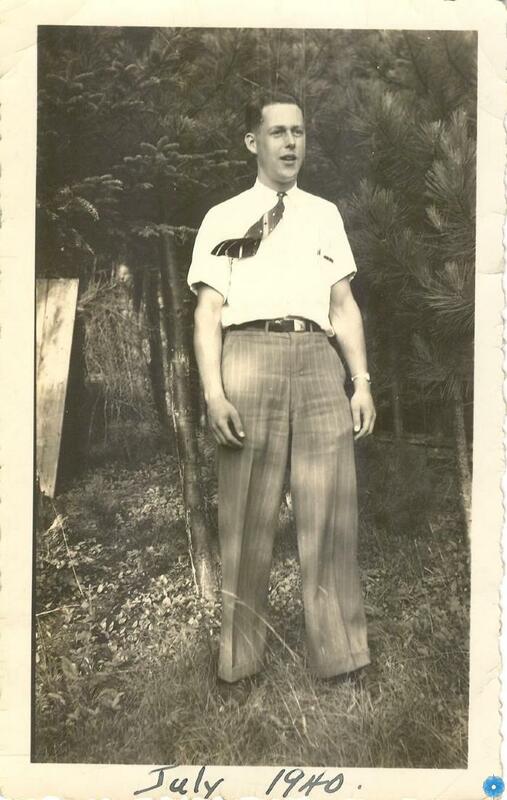 Andrew Clarke Gow was born 11 September 1918 in Bridgewater, the son of the late Walter and Jean (Clarke) Gow. Andrew was a member of the Bridgewater Baptist Church and taught Sunday School. In his younger years, Andrew worked for the family business. Attended McGill University in Quebec and went into the insurance business in 1939. He was a Lieutenant in the Canadian Army from 1941 to 1946, serving overseas from 1942 to 1945. Andrew Gow worked as a life insurance broker from 1939 to 1995, becoming a charter life underwriter in 1954. Andrew Gow was also chairman of the Housing Authority for 28 years. Volunteered for many years with the Boy Scout movement. Past Kinsmen charter member, past president of the Kinsmen Club of Bridgewater and past Governor Kinsmen and life member of Kin. Past president of Bridgewater Board of Trade, Bridgewater Curling Club and South Shore Community Concerts Association. Life member of Bridgewater and Area Chamber of Commerce, past chairman of the United Baptist Convention. Married to Phyllis Martin and had two sons Richard and Robert. Andrew Gow died September 21, 2013 at age 95 and is buried in Brookside Cemetery, Bridgewater. Description: Small black and white photograph of a young man identified as Andrew C. Gow of Bridgewater. Wearing a short sleeved white shirt, a tie that is blowing to the right, pin striped trousers with a cuffed leg and dark shoes. There are evergreen trees in the background. Possibly taken on the Gow property, Alexandra Avenue, Bridgewater. History of Use: Taken to document a family member.